The first step in The Lancer Method, this retexturizing treatment targets the first signs of aging to reveal glowing, radiant-looking skin in one use. Developed for sensitive, dehydrated or delicate skin, the advanced formula combines soothing Chamomile with enzymatic and softer physical exfoliants for a youthful appearance. Extra-fine Magnesium crystals gently buff away built-up surface cells, while Pumpkin and Pomegranate Enzymes soften skin and minimize the look of fine lines and wrinkles. Dullness, dryness and uneven texture will be diminished, leaving skin unbelievably soft, smooth and bright. The Method: Polish for Sensitive and Dehydrated Skin is formulated with softer, finer crystals than the original Polish. Uniform in both size and shape, these natural Magnesium crystals evenly exfoliates without abrading or overdrying the skin. The Lancer Method for Sensitive and Dehydrated Skin is Dr. Harold Lancer's signature regimen of daily exfoliation, cleansing and nourishing the skin. Ideal for redness-prone complexions with very dry or delicate skin, this product should be used in synergy with Cleanse and Nourish for optimal results. 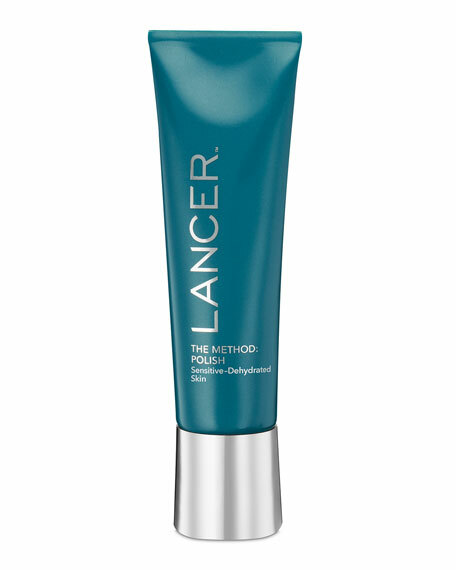 Together, the three steps of The Lancer Method dramatically improves the appearance of fine lines, texture, discoloration, and dryness, revealing a radiant, younger-looking complexion. Rinse thoroughly then follow with The Method: Cleanse for Sensitive and Dehydrated Skin (sold separately).